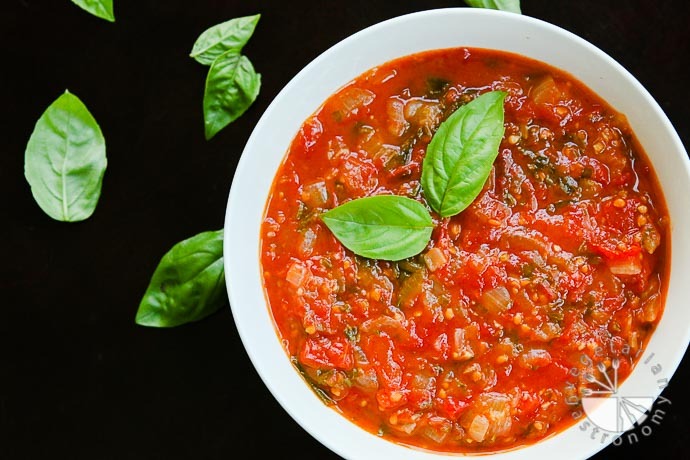 Everyone needs a fantastic fresh tomato sauce recipe which can be used for various pasta dishes, eggplant parmesan, pizza, or anything Italian! Well here is my version of a basic, yet fantastic, spicy tomato sauce. I had developed this recipe awhile back when we had tons of fresh tomatoes growing in our yard. 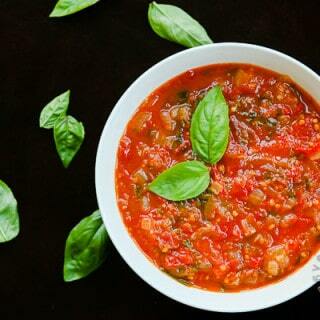 What better way to use them than to experiment and develop a delicious all-purpose tomato sauce. This Italian sauce is composed of simple, yet tasty ingredients. The flavor really comes from letting everything marinate, cook, and reduce together to form a thick and chunky sauce. I love adding a slight kick to my Italian meals with the use of red crushed peppers, but you can easily omit them for a non-spicy version. I also generally like my sauces to be slightly chunky with actual pieces of tomato still intact, but you can just as easily completely puree this sauce for a sauce that has a smooth consistency. This sauce can easily be made ahead of time and is freezable for quick meals when you just don’t have the time. 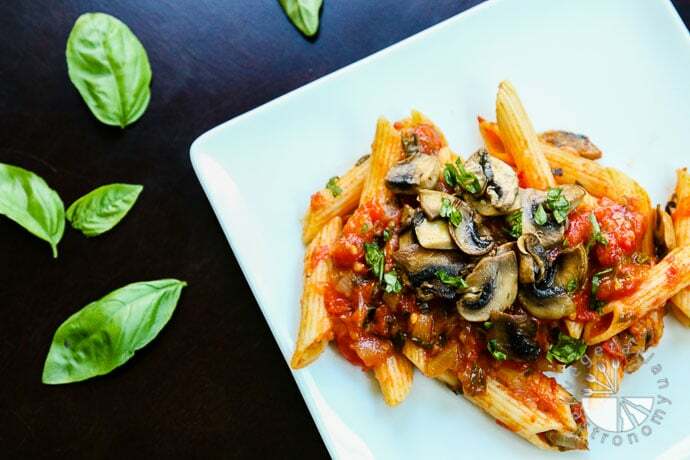 I’ve tossed this sauce with some sauteed mushrooms and penne pasta for a quick and healthy pasta dish, used it to make pizza, or even as a basic dipping sauce for toasted bread. It is versatile, and I can’t wait to share with you yet another recipe you can make using this pasta sauce. Coming up next week is a great entree you can make for a dinner party! Until then, I suggest you whip up a batch of this pasta sauce recipe to keep handy for the upcoming Holidays. Everyone needs a fresh, spicy, marinara! This recipe is great for pizza, pasta, lasagna, eggplant parmesan, or dipping and freezes well! Add the minced garlic and fry for a few seconds until fragrant, mixing frequently. Add the chopped onions and cook until the onions just start to become translucent (be sure not to burn or over-cook the onions). Add dried red crushed peppers and fresh thyme leaves and cook for about 30 more seconds. Add all the chopped tomatoes and adjust heat to maintain a gentle simmer. Cook with a gentle simmer for about 1 hour (or until desired sauce consistency is achieved). The sauce will reduce by about 1/2 or until it has a thick sauce-like consistency. Note that this time may vary depending on how juicy your tomatoes are. About half way through the reducing step (or after 20 minutes), add in the chopped basil and mix in. Season with salt and freshly ground black pepper to taste. Depending on the sweetness and acidity of your tomatoes, you may need to add a slight amount of sugar to taste (since fresh tomatoes from the garden were used to develop this recipe, no sugar was added). Once the sauce is reduced and reaches desired consistency, use immediately or cool and store in the fridge. This sauce also freezes well. This sauce can be used with pasta, pizza, eggplant Parmesan, lasagna, as a dipping sauce, or anything Italian! Thyme Springs - Run two fingers down the stem in the opposing direction of the leaves and they will easily fall off. Such a delicious sauce, full of flavor, texture and colors! Good recommendation. Worth trying! Made this sauce last night for my hubby and I and it turned out delicious! I did have to improvise since I didn't have fresh thyme (used dry jar thyme) and doubled the garlic , onion, and red crushed pepper. Thanks so much for the inspiration. Thank you so much for trying out my recipe, and so excited to hear that you thought it was delicious! 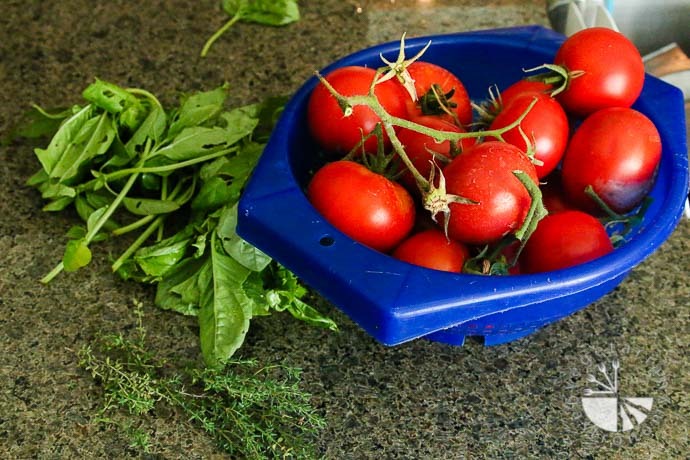 Making your own fresh tomato sauce can really make all the difference! I love your modifications...you can never have enough garlic, onion, and spice =) Thanks so much for the comment, I love hearing from people who have tried out my recipes! Hi there! This is definitely not meant to be a quick sauce at all, mainly because of the use of all fresh ingredients. Letting the sauce simmer and reduce for about an hour is what gives it that awesome flavor. 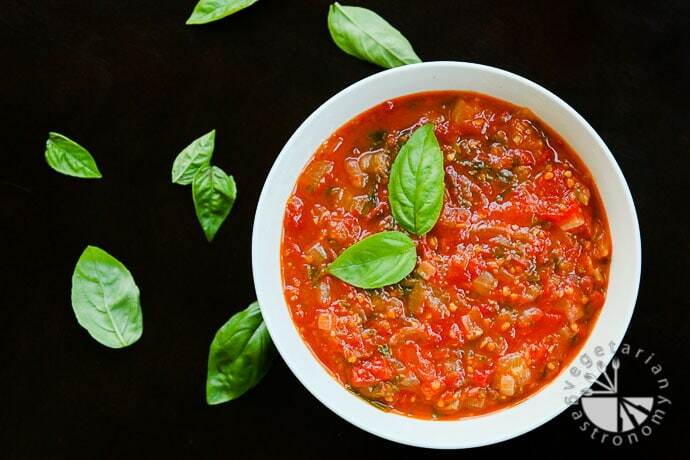 I typically make a large batch of this sauce at once, especially when I have home-grown tomatoes, and freeze most of it to pull out for quick meals when I need :) Thanks for trying it out! This recipe is DELICIOUS! It is our new family favorite; it is SO flavorful with the garlic, basil and red pepper coming through, my husband licked the bowl! I did add a pinch of sugar as it’s winter on the west coast and that added just the right softness. Thanks for the great recipe. An instant classic! Thank you Karah!! What a great review...when you have someone licking the bowl clean, you know it's a good sauce :) thank you!! Homemade sauce was perfect. We love it.